PULL into your driveway at home, plug in and refuel. No, it's not the Jetsons. The technology is available now and is adaptable to modern living. 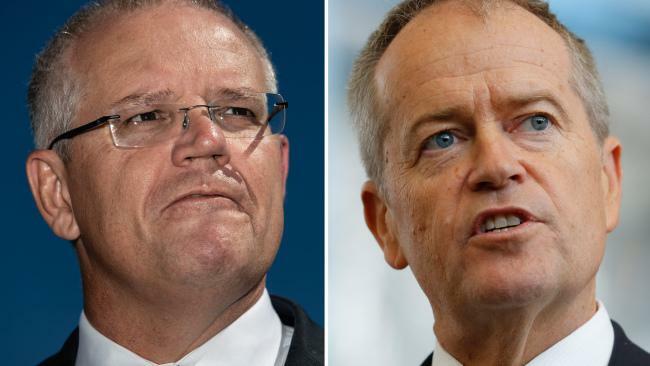 The race is on to secure the next mainstream fuel which will power cars, and while the jury is out on the best option, Holden is putting its best foot forward with the Volt. With battery power good enough to get you 70km, with petrol [providing back-up to increase the range to more than 600km, the Volt is testament that alternative fuels are here. While we've seen mainstream hybrids before, this is different. 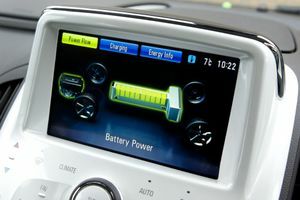 The Volt can run solely on batteries charged by electricity from your standard powerpoint, or purely on petrol that powers a generator to keep the car running when the battery runs out. Those who travel less than 70km daily could bypass trips to the servo permanently - with electricity costing about $2.50 to recharge the battery from empty. Functionality and innovation meld in the groovy cabin. Curved lines and refined finishes are befitting the $60,000 price-tag with minimal use of hard plastics. 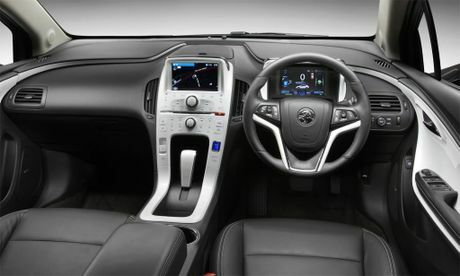 Two 17cm colour displays, one central in the dash and the other for the driver, dominate your vision once sliding inside. The glossy smartphone-like dash set-up is intuitive in operation but does take some initial analysis of the labels to find your way around. All four seats offer excellent support and even the back pairing have ample head and leg room - although the steeped roofline would cause issues for those over 180cm when sitting in the rear. Driving like any other four-cylinder car, the uninitiated would struggle to pick the difference if not for the silent start-up and slick internal displays. Launching the engine fits the futuristic mould. Pressing the start button is accompanied by a "powering up" sound effect. Acceleration is swift and immediate when on battery power, and doesn't feel much of its 1700kg bulk (200kg courtesy of the battery) - which makes the Volt heavier than a Commodore. It actually corners well and rides comfortably, although it doesn't take much to push things too hard and the stability control is quick to take action. Power output drops when running purely on petrol power but most drivers would still find its performance adequate. The only real issue is the low front guard which seems to scrape on just about everything but it's pliable and is positioned for aerodynamics. There are three primary driving modes. Normal is used the majority of time, and will automatically switch to petrol when the battery empties. Sport mode is similar, but reconfigures acceleration response to provide quicker torque application in hard driving situations. Then there is Hold mode which allows you to use the petrol generator and save the battery power. But it's not the driving experience which is most engaging…it's the gadgetry. The array of consumption analysis is all consuming. Standard equipment includes two colour LCD displays, Bluetooth connectivity with voice recognition, front and rear park assist with rear view camera, brilliant trip computer and fuel/battery consumption analysis, cruise control, climate control air con with three different modes, DVD stereo player with 30GB hard drive and USB input/iPod compatibility, sat nav, keyless entry and push button start. Safety is five-star, with eight airbags, the battery compartment is formed in a T-section (centrally mounted inside the crash protection structure), while the Volt is also armed with stability control, traction control, anti-lock brakes, as well as having lane departure warning and forward collision alert. There really aren't any competitors in this size, but there is the Mitsubishi i-MiEV Mi ($48,800) which is available on order only after being withdrawn from showrooms due to slow sales. A swag of hybrids are now available, but none have the Volt's functionality. Our week-long test over 700km returned fuel consumption of 3.1 litres/100km. 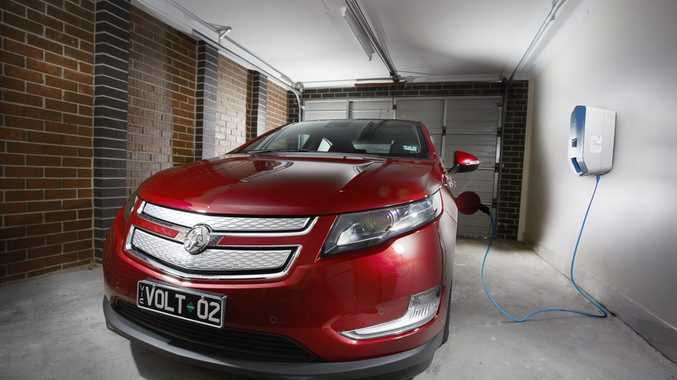 The Volt takes 10 hours to charge from a six-amp powerpoint or six hours in a 10-amp-plus outlet via the chunky cable that wraps up like a hose and is housed under the floor in the boot. Charging can be programmed to take advantage of off-peak rates. Charging stations are limited at the moment, and the recent issues surrounding electric-vehicle charging infrastructure provider Better Place has put the roll-out on hold. When you do need petrol, it runs on premium unleaded. There is ample room for four adults, while the two rear pews have easy access to the child seat anchor points. Those back seats also fold, and combine with a handy boot space for a good load area. We transported an adult bike easily with room to spare. Driving an environmentally conscious car no longer has to look gawky. Cut from a similar cloth as the Honda CR-Z hybrid coupe, the Volt is a blend of sporting aerodynamics. It stands out from the crowd…but in a good way. The good stuff: Near silent operation at all speeds, styling inside and out, possible to live without petrol power. What we'd like to see: Lower pricing, improved battery powered range, faster charging from home powerpoints. Warranty and servicing: Three year/100,000km warranty. Capped price servicing of $185 is offered on Volt's first four standard scheduled log book services for the first three years or 60,000km, whichever comes first. Eight year/160,000km transferable warranty covers Volt battery and Voltec components. We went three days without changing, and spending a cent on fuel. This hybrid system works, and works well. Yes, 70km is not far, but many Australians travel less than 80km daily. What the Volt lacks in driving prowess it more than makes up for with engaging efficiency and technological wizardry. Electric powered cars are being trialled the world over, and those experiencing the change are embracing the latest innovations. It's not perfect, but things will change quickly.